You are here: Home / Hiring and Selection Procedures for Teachers / How do you Retain Your Best Teachers and Staff? How Socialization, a School District Human Resource Strategy, Could Make All the Difference. When new teachers and staff join a school district, seldom are principals wondering, “How do I retain teachers that I’ve just hired?” However, when new teachers begin it’s a time of hope and uncertainty. Numerous task, job role, culture, and social demand questions loom in the back of new teachers’ minds in the first several months with any new school district. Teachers are also uncertain about how well they will fit within their new school district. These uncertainties can affect any school district’s effort as they ask the important question of how to retain their best teachers. A standardized socialization process is essential. How school districts plan and guide the transition from new hire to the first year or two of employment will likely influence levels of commitment, engagement, turn over intentions, and perceptions of how well they “fit” with their new organization. Standardized socialization sounds like a brainwashing experiment by a cult or some fanatical political movement. You’re not asking new employees to help you take over the world, (yet) you’re telling them the story and mission of your district and how they can help become a part of the story and help you achieve goals that will lead to district success. Research indicates onboarding and planned socialization efforts are frequently inadequate and leave new employees with lingering questions about their new employer and how they fit in. Newcomers will naturally have questions about their role, the organization and future opportunities. Often, information seeking by new hires can cause misinterpretations by incumbent employees who may believe new employees have motives other than discovering more about their job and the organization. Effective organizations are proactive and anticipate common concerns and questions. Effective school districts are asking “How do I retain teachers?” the day they are hired. Manuals or handbooks of standard procedures, organization charts describing how to access common resources needed, and planned mentor-mentee relationships are all tools that can be effective in providing a uniform experience for new teachers in a school district. The fluid nature of today’s classrooms and learning environments require teachers and staff members to be adaptable and committed to goals established by the school district. Commitment is built on a trust relationship that must begin through socialization from the first day a new employee enters the organization and nurtured through established relationships over the next several months and years. In the previous section, recommendations were given for standardized experiences of newcomers. Manuals and handbooks can be useful to preempt common questions and concerns, but relationships may be a more effective way to establish feelings of commitment to the district and the people already working to accomplish commonly held goals. Research indicates that when providing structured relationships with experienced insiders, it becomes more likely that information regarding organizational goals and values (provided through training guides and genuine commitment from mentors) will lead newcomers to be committed to the organization. Through mentor-mentee relationships, newcomers learn to interpret events, learn appropriate attitudes, and behavioral norms. Mentors offer a common message about the district’s values to newcomers. Values can be advertised on websites and walls to attempt to convey what an organization stands for, but until others see those values embodied and lived out by the people who work for the organization it is difficult to buy into them. Meaningfulness– How meaning in work is derived, how useful the person feels, and whether their work feels worthwhile. Safety– Does the new teacher feel able to express their true self without fear of negative consequences. Availability– The belief that one has the resources (physical, emotional/psychological, and knowledge) to invest themselves in a role. So how does socialization fit here? School districts should provide new teachers opportunities to experience meaningfulness. Often new teachers are expected to sit on the sidelines with their mouth closed. It is often assumed since they haven’t worked for the district, or have little experience teaching, their opinions aren’t valuable. New teachers should feel safe to express themselves and share what they have learned or experienced. Finally, newer teachers will do better if they have the resources (physical, emotional/psychological, and knowledge) needed to perform in their respective role within the district. Every May and June school districts ask themselves how to retain their best teachers, these three factors are especially important to newcomers who are dealing with high levels of uncertainty and anxiety in their new roles. Districts that have an overwhelming number of new teachers who feel unprepared and overwhelmed may need to reevaluate their teacher hiring process. 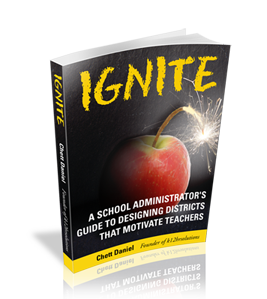 Teachers who feel engaged the school district’s mission, believe they are part of the team, and see their role in the process are more easily retained and more likely to help the district achieve the goals they have set for themselves and the community. Do you Want to Orientate by Design or Default? 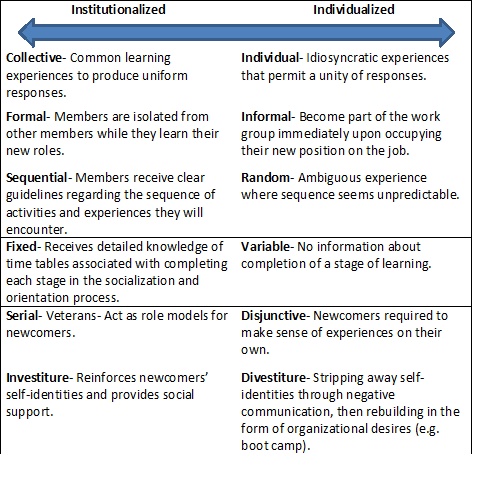 Research has identified six dimensions of socialization that are said to exist over two broad continuums. These span two categories seen as either institutionalized or individualized socialization efforts. One side of the continuum is orientation by design where new teachers experience less uncertainty, are led to interpret new experiences and the context of the organization by selected mentors. As a result new members are more likely to feel like they “fit,” have higher levels of self-efficacy, are more satisfied with their job, and are more committed to their organizations. On the other side of the continuum is an absence of structure which is related to increases in uncertainty, heightened anxiety in early work experiences, and employees are often unsure of how they “fit” within the new organization. See if you can figure out which side of the continuum your district should be on to have a better chance at retaining new teachers. How do You know if Socialization Tactics are Working? Organizational psychologist believe the socialization of newcomers has become more important than ever as individuals change jobs and careers with increasing frequency. If school districts are interested ways to retain good teachers, they need to plan on strategies to help them feel that they are a part of the district, that their ideas and work is valued. They need to feel they have the resources available to accomplish the job they’ve been asked to do, and they need to believe they have colleagues who are there to help them whenever needed. 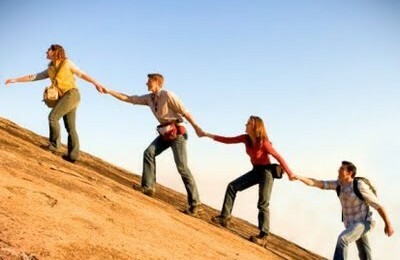 Socialization is believed to be most important in this very point. Social tactics help new hires develop relationships with co-workers who can provide them with information feedback, coaching, and support which are key factors in engaged employees, but also act as a buffer to the negative effects of job demands that new teachers often deal with. So how will a district know if the socialization tactics are working in their school district? One of the biggest and more obvious indicators may be the ability to retain new teachers. Other indicators are effective job performance, early establishment of satisfactory work relationships (with other new members, as well as more veteran members of the staff), understanding of the organizational structure of the district and strategies to tap into available resources, and a shared appreciation of the school districts organizational goals, values, and history. Using these criteria, how well would you rate your district’s efforts to socialize new teachers as part of a larger strategy to retain your best teachers? Effective school districts don’t have to ask, “How am I going to retain effective teachers?” They already have a plan.